In these days, everyone is talking about UOM more and more because of our university’s students already excel in international level. Team Shark, Bit masters; they are very popular in all over the world and people are talking about their victory vainly. Our sharks able to bring our little island’s name to the highest by defeating more other developed countries than us. So today, our Mora Mag crew found another new 4 sharks to the topic. Who are they? 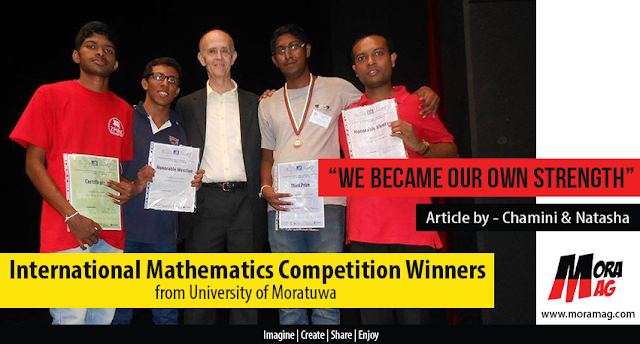 They are experts in Mathematics who competed at the International Mathematics Competition (for undergraduates) 2016 which was held in Bulgaria. In names; they are Melanka, Kanchana, Isura and Chirath. “Participation is more important than bring the victory. But when it has both participation and the victory? Wow… that is excellent.” Yes! They came up with the victory. They came up with lots of experiences. So, here’s what they share with us…. Q1: What is this IMC? We began the conversation with the main topic. Melanka: IMC means International Mathematics Competition for undergraduates which was organized by the University College, London. In this year, the season 23 of the competition was held at the American University in Blageovgrad in Bulgaria for 25th of July to 31st of July. There were around 72 countries’ undergraduates who are really ace in Maths had been participated to the contest as groups from each university. We had to face for the contest on the 27th and 28th of July and each day, we have given 5 mathematical problems to solve. After that clamorous and blistering battle, Kanchana could able to win the brownz medal and Isura and I could able to win honorable mention. Q2: This is the first time that UOM had taken part to this competition. Are there any competitors who has already face in this contest from SL? Yes. This is the first time of ours. But before that University of Colombo has taken part in this contest for 3 times. In last year, they could able to win 2 silver medals and a browns medal. As the first time of UOM, It was a momentous moment for us to show our colors internationally. Q3: Can you give a little introduction about yourselves? Melanka: I’m a level 3 undergraduate from Department of Computer Science and Engineering (CSE). I’m from Battaramulla and went to Vidura College, Hokandara. Kanchana: I’m also a level 3 undergraduate from CSE. I’m from Pannipitiya, went to Royal College, Colombo 7. Isura: I’m a level 2 undergraduate from CSE. I’m from Kurunegala and I studied at Maliyadeva College since primary. Chirath: I’m a level1 undergraduate from Faculty of Engineering and we haven’t divided into departments yet. I went to Ananda College, Colombo. Q4: Since Mathematics is really a difficult subject; most of the students are suffering from it. So, how did you guys could able to sail through it? What is your magic of good at Maths? Melanka: I was also at that category that you mentioned early before came to grade 8. When it started to teach algebra, geometry I could able to find myself easy ways to solve those questions and little by little I was keen on more and more of Mathematics. My parents also supported me to improve my Maths knowledge. Through Vidusara magazine, I was aware of the Olympiad competition and follow its reading materials and lessons. I could able to select for the Sri Lankan Olympiad team in both 2012 and 2013; but I was unable to participate in 2012. Isura: I was excel in Mathematics since grade 8. Before that actually I can’t imagine how I was done. My mother is good at Mathematics so she always guided me. I was able to get my first chance to participate in Olympiad competition in 2012. I showed my colors at the university also. Kanchana: Since my childhood, I had a crush on Maths and I came forward in Maths since grade 9. I also keen on Olympiad competition. In 2012; four of us attended to the Olympiad competition including Isura and me from Sri Lanka. Chirath: I was eager in Maths since my childhood and I got best marks for the term tests. After the selection of IMO (International Mathematics Olympiad) in 2014, I had been participated for its training courses. Q5: Can you remember of your O/L and A/L results? Q6: Wow. Absolutely you guys are really very well. So, how did you know about this competition? Maths Department of Engineering Faculty and Maths society of UOM had announced of the selection rounds of this competition. Four of us were sailed through it. Our seniors had been participated in this contest before us. So we always had their support. Q7: What kind of a motivation did you receive from the university? Who helped you? First I should say that, unless the eager in Mathematics of four of us, we couldn’t do it. And in this case, all of one from the Maths Department were supported us. Especially Pro. Sarath Peiris (HOD of the Maths department), Lecturer Mr. A. Rohana Dissanayake and Lecturer Mr. U.A. Senevirathne were the persons who always motivated us. And we should thank for our VC Pro. Ananda Jayewardene and the Dean of our Faculty for sponsoring for the air tickets. Further, we should thank for all the lecturers of our department and for our batch mates. As that so, we really thank for our past years’ competitors Isuru Fernando and Buddhima Gamlath for training us for the competition. Q8: Actually it is a triumph that internationally represent our country Sri Lanka. So, how did you feel it? What kind of experiences you got from participating in this contest? Melanka: Yeah. It is a great pleasure to have a chance to represent Sri Lanka internationally at this competition. We met lots of pupils there who are keen on Mathematics. Most of them are undergraduates who follow full time Maths degree courses. We shared our ideas together. We had fun times also. Actually more than receiving Maths knowledge, we have gained lots of experience from this. Since it was Chirath’s first foreign tour, it was so special and a new experience for him. Q9: Okay ... What are your advices to give other undergraduates or school students regarding Mathematics or any other subject? Melanka: I’d like to say that move beyond in your own field. Sometimes you may fed up with your academic work. However try to find and follow your own passion. It makes you happy and it will useful for you. Sometimes it may hasn’t a link with your formal education path, but never lose your own passion. One day it will carry you for better opportunities. Kanchana: The real story is… if you need to achieve something, you should give your effort and you may have to sacrifice some other things in life. Without hard work and dedication you can’t achieve them easily. And another thing is, if you are keen on some subject or field, find some other persons who are keen on it as you. It will be useful for your future carrier. Melanka, Isura, Chirath and me; we could able to achieve this competition because we have known each other well and we have same tastes of Mathematics. Do not ever regret of your interesting things once you lose them, because it is not the end. There may be some other ways to achieve it. So, go and find them. Chirath: I also have to say the same thing as Isura. I’m still new to the university and we are not divided into departments yet. So, I don’t know exactly how it will be. I think it is important to concentrate on our work and do them better. Q10: Do you think that you gave a good fight at the competition? Can you really satisfy of your performance? Melanka: Actually I wish we could face the competition better than this. It was depended on the moment and on our fortune. Since this was our first experience of the international level and since this was the first time that UOM participated for IMC, we can satisfy of it. Kanchana: Yes, we had a good fight. This time the paper was prepared specially target on the students who are doing Maths degrees. So in myself I didn’t expect that I could able to win the browns medal. Actually we could perform more than this unless the little mistakes we have done. Isura: We had to perform more than this. However we were able to score 79 points and won the 63rd place. Chirath: This is my first international competition. In fact, through this, I wasn’t able to win. But I am glad of participating for it because I got a lot of valuable experience through IMC. Q11: When working as a group, what kind of a contribution each of you gave as its members? Melanka: We were the strength of each other. Actually we had only two days to gather as a team and engage with work before the contest because we were busy with our exams. Within those two days, we achieve a lot of things as a team. Our team work is the main reason for our victory. Kanchana: Actually we have been known each other for long time. Melanka and I are from same batch. We have known Chirath since 2012 from the Olympiad training program. And Isura also took part in 2012 Olympiad contest. So we have known each other very well and there was a good understanding. It helps us to be comfortable on working with each other. Isura: Definitely. Team spirit is a great thing when participating for a competition like this otherwise we couldn’t able to bring such a big achievement like this. Actually we became our own strength. Chirath: All of these 3 brothers gave me the strength. They always helped me in difficult subject matters and all about the competition. So I should thank them for their encouragement. Q12: Do you guys have any future plans in Maths field? Melanka: I had a long time desire to go ahead in Maths field. Since I’m following an Engineering degree course, I still keen on it. I hope to participate for IMC in next year also. So I’m waiting for wings. I do hope to do my best next time. And I have a dream to improve Mathematics education in Sri Lanka and I think it is a great opportunity to improve the awareness of the subject. Kanchana: I also hope to participate for IMC next year and it will be Melanka’s and my last chance to participate for it. And I hope that Isura and Chirath will go ahead on this path as their maximum. Isura: I also hope to go ahead on this path but economic problems can be affect us. Chirath: I hope to participate more other competitions like IMC and hope to do my studies well. Q13: Finally, let us remind that who support you to come on so far in life as successful students in this way? For whom should you thank? Obviously we should thank our parents. Without their support, we can’t come this far. And we should thank for all the lecturers of our department and for our batch mates. They helped us to finish our project evaluations soon and focus on the competition. Thank you all who helped us in every ways. Q14: So we also should really thankful for you for have an online interview with us for share your experience of IMC by reserving your valuable time. We wish you all the best for your future carrier. So finally, do you have something to say for Mora Mag? Yes. Mora Mag is a successful cyber magazine which is run by the UOM. We wish you all the best to continue this so far. This is a really good thing. Most of one exactly didn’t know yet about our victory. So all of them will have known us through Mora Mag. It will be a great motivation for students for find new paths of their own fields. Thank you very much Mora Mag. You have begun a great service for all students. Our IMC winners share their story as this way. Absolutely our sharks are full of immeasurable talents. And they are strong enough to excel in international level. Our new sharks proved it properly. If the responsible persons of parties can help them, there’s no doubt that one day, our sharks will touch the sky.